Okay, the headline is misleading, but the simple reason is that I want all the shrimp to myself. Shrimp makes you fat and you don’t need the extra weight, so let me have them all. If you have followed this blog, you may have noticed I don’t write a lot of beer and food pairings stories. But, that said, when I do, the food seems to always be shellfish. Why? My wife, Leigh, who is friggin awesome, is from New Orleans, and when you marry a woman from New Orleans, you either learn to love shellfish, such as crawfish, shrimp, and oysters or you starve. I’m not a fan of starving. 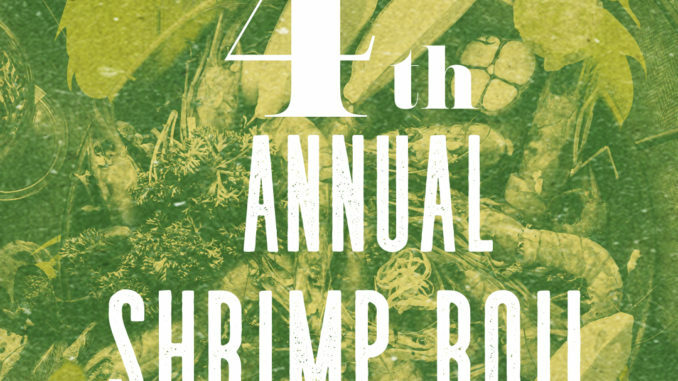 Clearly, my friends at Saint Louis Hop Shop got the memo, because, for the past four years, they have been on it by hosting an annual shrimp boil. Shrimp and beer. Ummm, yes that is the recipe of life. For me, I enjoy a beer that doesn’t overwhelm the shrimp. I suggest a solid lager or kolsch but I have had some nice nights with a fine IPA as I peel my shrimp effortlessly. For me, the beer should be almost be an afterthought, because I’m probably there for the shrimp. Other beers that I suggest would go fine with a boiled shrimp is a fine weissbier. I find a wheatieness of a weissbier balances nicely with the soul of the shrimp. 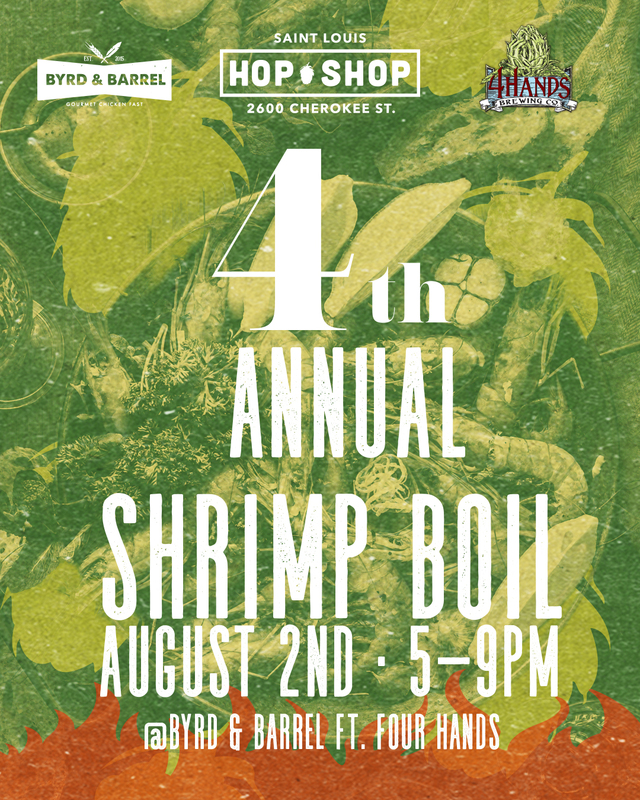 This year’s boil, the 4th Annual Shrimp Boil, is a partnership with Byrd & Barrel and featuring 4 Hands Brewing Company. This is one of St. Louis Craft Beer Week‘s most anticipated events, and rightfully so. This year’s Shrimp Boil @ Byrd & Barrel will be hosted on the outdoor patio of the Cherokee Street anchor. Enjoy music, succulent seafood platters of shrimp and andouille sausage, + some specialty beers from 4Hands you won’t see a lot of out there! Come by Thursday August 2nd and fill your belly while listening to live music and enjoying the summer breeze ? Stop on by for a good time with great food and thirst quenching beer! This event is FREE to attend and is also family friendly. Early arrival is STRONGLY suggested!